We Were the First Paramedics at Pulse Nightclub. We’d Trained for Mass Shootings, and Now the Deadliest Ever Was Happening. Carlos Tavarez and Joshua Granada were the first paramedics to arrive at the Pulse nightclub after a gunman opened fire in the early morning of June 12, 2016. Over the next few hours they transported 13 people with life-threatening injuries to the Orlando Regional Medical Center (ORMC). All survived. The pair were exceptionally well-practiced in how to handle a mass-casualty incident. 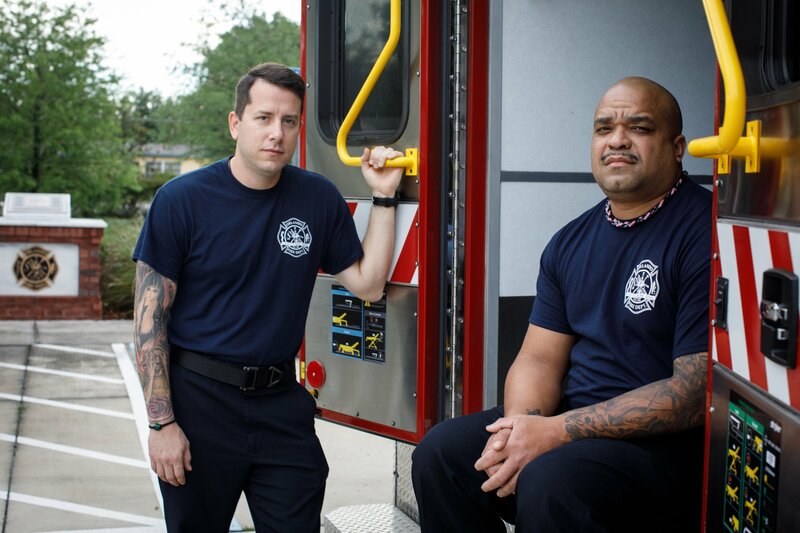 They regularly team up in paramedic competitions, and have twice been crowned national champions. But they don’t usually work together. The night of the shooting marked the first time in four years. Tavarez and Granada, who are best friends, talked to The Trace about how they aided the survivors of Pulse, about their training, and about how they have coped with the aftermath. Joshua Granada: I was the driver that morning, the engineer on Rescue Number Seven. When the shooting started, around 2 a.m., we were literally right down the street from Pulse, at ORMC. We’re typically stationed a mile or two away, but we had just dropped off a guy. I was outside, putting the stretcher in the ambulance. I thought I heard fireworks, but I wasn’t paying much attention. That’s when Carlos came running out, yelling at me, “There’s a shooting at the Pulse!” He’d been talking to an officer in the ER, and heard it over the guy’s radio. We weren’t dispatched to the call — so we weren’t supposed to go — but we took off. The hospital was a half mile up the road from Pulse. Tavarez and Granada arrived just minutes after the first 911 call was made. Carlos Tavarez: We saw lots of people running. We heard shooting going back and forth. It probably only lasted a minute or two, but it seemed like forever. We saw a person getting helped across the street from Pulse to a nearby fire station, and we drove right up to help. JG: The man collapsed on a bench in front of the station. Carlos jumped out while I unloaded the stretcher, so I was maybe 10 seconds behind. Carlos cut off the guy’s clothes, and I could see he was shot in the stomach. When you’re dealing with gunshots, you basically have to get the person naked to figure out where the wound is. CT: Just before we took that patient to the hospital, I took a second to look around. I saw a couple people walking around and crying, but it didn’t really seem like there were any critical people. Yet. So we quickly dropped that guy off, and turned around in less than two or three minutes. I’m also a nurse at that emergency room and I told them, “I think you’re going to have a bunch of people coming in.” But I was thinking they’d have minor wounds. I didn’t realize how hurt people were going to be when we went back. Tavarez and Granada arrived back at the nightclub at around 2:15 a.m. Dozens of people were still trapped inside. Gunshots continued to ring out. Police had arrived, but the two paramedics were the only ambulance crew at the scene. Because the situation was so perilous, with an active shooter still on a rampage, other emergency medical vehicles were being held at a staging area about a mile away. CT: That’s when we started seeing the big, big injuries — the people whose injuries were extremely critical and needed to be off the scene. We saw injuries we’d only read about. We had a patient with what appeared to be a bullet wound in his back, between his shoulder blades. He looked like he was hyperventilating, and then he passed out. When I was finally able to take a good look at him, his chest looked like it was full of air. I thought one of his lungs had collapsed, but I wasn’t sure which one. JG: Carlos just — bam! — stuck two needles in the chest, and I saw the guy take a huge gasp of air. A double-needle decompression — that’s something someone might do once in their entire career. Might do, because there are very specific circumstances surrounding it. You’re taking one of the biggest needles we have, and you’re sticking it into somebody’s chest. It lets out all the air that’s trapped, the lung re-expands, and the person can breathe again. The paramedics sped back to the hospital with the man who had been shot in the back and one other victim. They briefly assisted emergency room staff and returned to the nightclub at about 2:30 a.m. It was their third time back at the club and they were still the only ambulance transporting patients to the hospital. But they weren’t the only medical professionals at Pulse. Paramedics from a fire station downtown were tending to victims and had set up a triage station across the street, outside an Einstein Bros bagel shop. JG: The main thing I remember was how organized the scene looked amidst that chaos. The patients were lined up in the driveway of the bagel shop. They were literally all in a row — feet toward the gutter, head toward the parking lot. I remember seeing six or seven people, thinking I’d need to triage them. Other paramedics — Glenn Shepard, Justin Hartley and Alex Hioki — were already there in the trenches doing the incredibly difficult task of triage. What they didn’t have was a way of getting victims to the hospital because, at that time, we were the only rescue truck going back and forth. When I jumped out, I was about to say, “Who’s the next person I need to grab?” And I didn’t even get the sentence out, because Glenn said, “Right there!” He pointed to the first guy in the line, closest to my truck. “He’s number one!” Then the guy next to him. “He’s number two.” And that was incredible. He had them on backboards. I told Carlos to stay in the back of the truck, and I’d grab as many people as I could. It saved a ton of time, and allowed me to just bring people to Carlos — like an EMS machine. CT: They had everybody sorted from the highest acuity to the lowest acuity. These were the type of wounds that are normally the most critical that we see, typically one at a time — and that night we had eight to 10 of them. Tavarez and Granada sped back to the hospital with five more gunshot victims. They returned to Pulse for the fourth time around 2:45 a.m. This time, they were kept at a distance by Byron Davis, a fire department official. JG: We heard secondhand that the shooter was claiming there were explosives everywhere. And in a situation like that, why would anyone doubt him? He’s already in a club doing what he’s doing. So law enforcement had to pull everybody away for safety. It was a very anxious time for us because we knew there were people to treat, yet we couldn’t do anything. The only thing we could do was plan. CT: We knew if they were bringing anybody else back out, they would go out of the club a different way. You couldn’t drive in front of Pulse anymore. JG: We talked about every possible scenario, just like we do for our competitions: If they do this, then we’ll respond this way. One of the scenarios we brainstormed was that we might have to pull people out of the back, and we talked out our route. After about an hour or two, law enforcement figured out that there were no bombs, and they breached the back of the club and started pulling more people out of the bathroom, where the gunman had everybody barricaded. We were the first ones to make it back there, too, believe it or not. We grabbed the first five people they pulled out of the bathrooms. They were also the last victims anyone took to the hospital. We’d only had two tourniquets on that truck. Luckily we held onto one until the last group, because, as it turns out, there was a woman with a really bad leg injury. JG: — and experience. You see enough really bad injuries, you know which ones need the tourniquets. It’s not like a cut from a kitchen knife. Had we not saved that tourniquet, it would have been bad for that patient. That was Carlos’s call. He just knew to save that other one. CT: The only way I can explain how we were able to keep going is: Josh and I do these crazy emergency medicine competitions. JG: There are about 10 a year that we compete in. CT: Not tootin’ our horns, we’re pretty good. We’re usually in the top five teams. We’ve been the number one team in the nation twice, and we’d seen this call a million times before. We’d practiced it. So when we were there, our muscle memory was just to treat the patients. We didn’t really pay attention to this huge event happening in front of us. When we got back to the station, around 7 a.m, everybody had been watching it on TV. They asked us what we did, and we were like, “We took people to the hospital, they were shot.” As if it had been a regular call. It took days to realize that I wasn’t on that call anymore. Like, I was still waiting for the next patient, the next group, who needed to go the hospital. The next week was the worst week for me. I was sad, had bad dreams. Throughout the year, I’ve had really down times. There are times when I’m indifferent, and there are times when I don’t want to deal with the situation. Today I’m having an OK day where I can talk about it. JG: I talked to Carlos about it every day. I just remember the overwhelming theme, to me, was “Can you believe we were there?” It was such a crazy coincidence that we were together. I’d asked to be at that station because I heard Carlos was coming in. We hadn’t worked together in four years. Not only that, but, technically, we weren’t even supposed to be there. When Carlos came out and said “Josh, we got a shooting,” I was supposed to call dispatch and let them know we were done at ORMC. If I had done that they would have sent us to the staging area. I would have seen people running away from Pulse, and I would have had to turn away from them. Lane Murdock, a 16-year-old sophomore from Ridgefield, Connecticut, is the organizer behind the National School Walkout on Friday. More than 2,700 schools have signed on to participate in the day of protest. Hundreds of thousands of people took to the streets in Washington, D.C., and across the country, seeking action on gun violence.